You don’t have to qualify for the #HAHD Challenge to qualify for this one (but you do have to be enrolled). Even if you’re already qualified for the 3rd #HAHD Challenge, you can still participate in this challenge. Pretty cool, eh? To qualify, all articles must be submitted under the same author name. Articles from multiple author names may not be combined. Leave a comment with any unanswered questions. Then get to work writing and submitting those 30 high-quality original articles! I am in for it. I have already Completed 100 Articles for HAHD Challenge. Hope to complete 30 articles in couple of days. Okay, 30 articles in a couple of days?!? That’s pretty amazing. I like this mini-challenge. I think I’ll go for it. This sounds great. Although I completed the first two challenges, I got too buried in client work to keep up with this one. I don’t think I can catch up now, but think I CAN do the mini-challenge. And… I’d love a cartoon mug! Even I will be most interested – main motivation here would be the many cups that could come in under the HAHD and the mini challenge. Count me in guys !! I’m signed up for the 100 Articles for HAHD Challenge but couldn’t complete it. Do I have to sign up again. I’d love a cartoon mug! No need to register again. 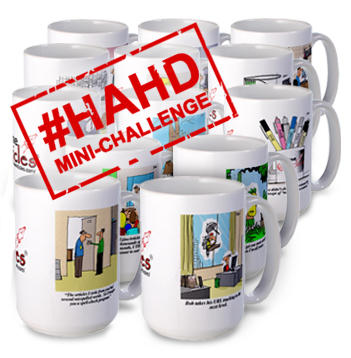 Just make sure that you’re registered for the 3rd #HAHD Challenge which is currently underway and ends at the same time as the Cartoon Mug Challenge. Hi.. i have the same case with Gail. Is it necessary to register again for this challenge? No need to register again. See my comment above. I’ve got 20 to go to reach the 100 mark – I’m sure I can stretch that to 110 to gain a mug! Does that mean I’d qualify for the HAHD mug & the cartoon mug? You know I am all over this! Time to get to writing! Got sick twice and hubby was in the hospital for nearly a week during this challenge, so I don’t think I can do the full 100 articles, but I think I can do 30 in 30 for a mug. I’ll give it a try and hope that the family stays healthy long enough for me to finish. Sorry to hear about your illnesses. Good luck with the mini-challenge. You can do it! Dear Chris Knight, I am still very new, have not even had a chance to enter my first article (power breakdown in our part of the globe). I have 2 Questions: Where do I submit it for review? Why are all article directories anxious to have large volumes of articles at once? Articles we submit are supposed to have a long ‘shelf-life’, as I understand it. Or do they go stale quickly? Or what? I am struggling to build a free website with the many sites available, and will let you know the address when possible. Once you’re a member and have signed in, you’ll be in the blue “Member’ Area”. Click on the “Article Manager” drop-down menu and select “Submit a New Article” to Get Started. EzineArticles.com doesn’t require you to submit articles in “batches”, though often that’s more efficient. Most of our Expert Authors simply submit one at a time. We do, however, suggest that both quantity and quality of articles have an equal hand in your success with article marketing. We recommend that you submit high quantities of high-quality, evergreen articles for the best results. I understand your problem. As a marketer I feel you need more help to develop your strategy in making your site popular. Amazing the incentive of a “little” mug to get one’s creative juices going. There is something about being able to look at and use this tangible reward for increasing our business. Can you become eligible for more than a single author name in this mini-challenge as you can for the HAHD? As with all of our challenges, you can indeed qualify under multiple author names and win multiple prizes. Remember, though, that each name must qualify separately. You cannot combine articles from multiple author names. I think I may have submitted 30 articles since the 10th. I have been writing 4 or 5 a day for a while. I’ll have to check to make sure! I would love another mug! I am psyched! What a fun thing to do! OK. HAHD completed today… my first completion!! Great job! If your last 30 for HAHD were completed within the time frame, they layover for the cartoon mug as well, meaning you don’t have to write an additional 30. I needed an additional 11 articles to complete my 30. This morning, I counted 4 times and each time I come up with a cartoon mug will be mine. Broke other arm patting myself on the back. Perhaps I should just pound myself on the chest like Tarzan. Less broken arms! I am about to submit 100 articles before the HAHD is over but want to have each going live daily, so will put them in the draft (not live). If I submit all 100 but put them in draft so that I can log in manually and make each live daily, can these 100 submissions before the midnight of the deadline – 10th April – make me qualified, even though they will be in the draft, not live?! Unfortunately, that won’t work since our qualification tracking system for these challenges looks at the submission date, not the creation date. However, your psychic skills seem to be working quite well. You correctly predicted my answer about the benefits of Premium Membership! Thanks for your response, Marc. My biggest problem is having all the 100 articles go live the same day. This will be certainly not help my purpose. Sadly I can’t afford the premium membership right now. But what if I click the submission button for each of the 100 articles and say 50 get turned down for “little” problems that can be fixed. Will these also get included as “submitted” and make me qualified, since all 100 were submitted but 50 had errors that will get fixed and re-submitted after the 10th April deadline? Statistically, submitting all 100 articles and having us publish them ALL in one day will net you MORE traffic this year than if you schedule released them over time. I know this advice feels counter-intuitive… which is why I studied it. Reason: Submitting articles is not like dollar cost averaging, but rather your traffic is equal to the number of articles X the number of days each article is live. Thanks a lot, Christopher, for your personal reply to this. I appreciate you getting in to reply to this. I would have REALLY argued about your answer that submitting all the articles in one day would net me more traffic, because I once submitted 100+ articles in a single day and submitted another 100 over the course of several days (I was a premium member for over 6 months) and noticed that the latter performed better than the former, but since you said THIS YEAR, then that could be where the winner is. I did this test last year, so perhaps this year things have changed. That said I will go ahead and submit all 100 articles today and tomorrow. By the way I did quality for the 1st and 2nd HAHD and definitely want to quality for this too, even though this is 400+ words, rather than the usual 250+ words. I must commend your fast approval system as 39 of the articles have already been approved within 12 hours of submission. But – I noticed the % bar that shows the percentage of completion of the contest has since stopped at 82% despite the fact that I have submitted all 100+. Any reason why? I also noticed the counter stopped, but we should have until 11:59 CST tonight. I’ve got one more to go. BTW, do the articles have to be approved or in Pending Status? I submitted 31 for the mini-challenge. One was considered a problem article and I wasn’t sure it would count. Anyway, thanks for the kick in the pants. Although I could probably do 100 in 100-days, my boss might not appreciate, since my primary role is direct sales. I am worn out, but it has been fun. I already published 30 Articles in your timeline. When i will get email from you ? And when i will get Cartoon Mug ?